Anytime a pilot took to the skies in World War II, they put their lives on the line. The courage to fly through enemy skies dodging artillery fire from the ground and dangerous German pilots in the air is impossible to fathom unless you were there. With “Luck of the Draw” you are there, September 17th, 1944 as the Allies initiated Operation Market-Garden over Holland. As C47 tow-planes and gliders fill the background, two fighter pilots battle for control in a World War II aviation dog fight. The moment is captured in time in “Luck of the Draw” as a young American Lieutenant William R. Beyer fires the shots that bring down German Ace, Major Klaus Mietusch. 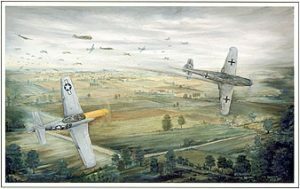 For WW II history buffs, P-51 Mustang admirers, pilots, aviation collectors and military families with members that helped liberate Europe, this limited edition art print by Marlin Troutman provides a story of courage, bravery and in the heat of battle a little luck. Only 500 Edition size prints and 50 Artist’s Proofs have been produced. This World War II aviation art print comes with a detailed account of this moment in time, as told by the P-51 pilot. Lt. William R. Beyer, and information on Beyer, Mietusch and Operation Market-Garden glider pilot Lt. John L. Lowden. This historical WW II aviation print will enhance any office, home, or gallery. Rarely are exact moments in time captured so perfectly. Lt. William R. Beyer the young P-51 pilot in the 361st Fighter Group’s 376th Squadron has verified that details of the painting, by Marlin Troutman, are historically accurate. The angle of the wing flaps, confusion of the gliders, and shooting of Major Klaus Mietusch in his Me-109 Messerschitt, are all authenticated. Lt. Beyer and Lt. John L. Lowden, CG-4A glider pilot during Operation Market Garden, have given their seal of approval by signing each of these limited edition prints. Order Your Limited Edition “The Luck Of The Draw” lithograph print, Today! "The Luck of the Draw" Each print is numbered and signed by Lt. William R. Beyer, Lt. John Lowden, and Marlin Troutman. This fine-art aviation print is presented on heavy-weight, 100%-rag, acid free stock, includes a detailed account of this moment in time.